Received a Bachelor of Science degree from the US Military Academy (1951). Entered Air Force in 1952. Flew 66 combat missions in the Korean War. Received a Doctorate of Science from M.I.T. (1962) Adrin’s thesis, “Guidance for Manned Orbital Rendezvous”, was later modified by NASA for use during all space rendezvous missions. First flew into space aboard Gemini 12. This mission successfully docked with an Agena docking target. 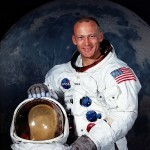 Became the second man to walk on the moon on July 20, 1969 with Apollo 11 crew mate Neil Armstrong. Returned to active duty in the US Air Force in 1971 and was assigned to Edwards Air Force Base as the Commander of the Test Pilots School. He retired from the Air Force as a Colonel in 1972. Legally changed his first name to Buzz in 1979. 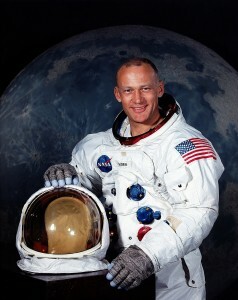 Aldrin remains active in space activism, serving as President of Starcraft Enterprises of Laguna Beach, California and Chairman of the Board of Governors of the National Space Society. 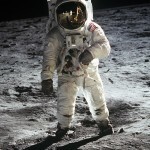 He has authored a number of books, including: “Return to Earth” which documents his difficulties following the first moon landing, “Men From Earth”, and the a science-fiction novel, “Encounter With Tiber”.